Quantitative Easing, as practiced by Ben Bernanke and Mario Draghi, gets a lot of attention. When it threatens to trip, the Stock Markets go ahead and fall anyway. When it seems like it may jump, the Stock Markets start skipping. Ben and Mario – those men know what it feels like to hold the world under a thumb. But it occurred to me recently that most of us don’t really know how it works. In fact – I didn’t really either, until I listened to a lecture given on the End of Western Affluence (When the Money Runs Out!!) by Stephen King. No – not the horror writer. The other one that writes about finance and works for HSBC. Never heard of him? Same here. But there we are. But before I get to that, let me give some background. An economy is a type of ecosystem. Said plants are then eaten by animals, who turn that chemical energy (still sugar) into kinetic energy and muscle and such. Those animals then move around, spreading seeds and being generally fertile. When they die, their bodies decay and form part of the soil nutrients. Which is all very neat. In an economic ecosystem, you might say that the interaction between plants and animals is quite similar to the interaction between companies and consumers. There are also similarities between a government and the geographic terrain (a government that does not provide water and good nutrients is not a good government at all). And the Central Bank… The Central Bank would be that little raincloud on the horizon, and the rain/water would be money. And what are the key drivers in this system? The Central Bank, who could use monetary policy to bring more or less rain, although it runs the risk of flooding by providing too much, and drought if it provides too little*. *There are those who would argue that everything would eventually adapt to deal with whatever lack of rainfall there might be, so we should just dispense with the weather altogether. Okay – so it’s not the greatest analogy. But we’ve arrived at the principle of monetary policy, and I think that there’s enough there to show that sometimes it can be quite necessary (unless you’re willing to suffer out an evolutionary process of adaptation); and that playing God with the weather is quite risky – especially when the Central Banker is trying to gauge the impact from his/her position way up in the atmosphere. Also, I’m sure you can see the temptation to use monetary policy over fiscal policy: rainfall can cover a large area in an afternoon. Try and scatter fertiliser across that same expanse, and you’re going to come up against geography, time and complaint. “Open Market Operations” – when the Central Bank “buys” government debt, it is lending the government money directly. The government can then use this to pay for whatever it wants to spend money on without having to borrow it from the public or having to raise the money first from taxation (ie. the supply of money increases). These purchases are usually short-term (in order to prevent inflationary panic – and also to get the money out more quickly, as the short-term instruments are issued by government more regularly). But this is usually the idea that people have in mind when they say “the Central Bank is printing money” (ie. the Central Bank is lending money directly to the Government, and the Central Bank has no limit on how much it can lend). “Interest Rate Setting” – interest rates are the price of money, because they establish a price for the use of money by borrowers, as well as the price to be earned by the lenders of money (the savers). So by playing with the price of money, the Central Bank will affect the demand for money. For example, increasing the rate makes it more expensive to borrow, and more beneficial to save. So while the money supply may stay the same, there will be more of it sitting in bank accounts and less of it being spent on investment and stuff. “Managing Reserve Requirements” – Central Banks get to set commercial banking reserves. This gets everyone to the same place as interest-rate setting, just in a more dictatorial manner. For more on this, I’ve written these posts on banking reserves: What Is All This Talk About Banks and Basel? and Stuff You Should Know About Reserve Requirements. So the above are great, until you start running into awkward places like “the Zero Interest Rate bound”, as all the economist hobnobs like to call it (basically, the point where the short-term interest rate is zero), which cuts out option 2. And usually, that happens when the economy is experiencing a bit of a recession (otherwise, everyone would be happily borrowing as much money as possible because a zero-interest rate means that you’re borrowing for free!). Unfortunately, zero interest rates in a recession don’t compensate the banks for the risk of lending money. AT ALL. I mean – if you go and put an application in for a mortgage bond, or a new credit card, or anything that involves taking some of the bank’s money, there’s a cruel department somewhere behind the salesperson’s desk that spends its time doing credit assessments on you and the likelihood of you being able (and willing!) to repay what you’ve borrowed. If you’re likely to fail, then they’ll probably refuse to lend money to you. And if you’re moderately risky, maybe they’ll allow you to borrow the money, but you’ll be landed with a giant interest rate. What’s the general population’s risk factor in a recession? “Unlikely to pay back; and especially unlikely to pay back when we tell them what interest rate we’d need to charge in order for it to be worth our while”. In other words: the banks seriously slow down their lending practices, which is the traditional “credit crunch” all said economist hobnobs like to talk about. 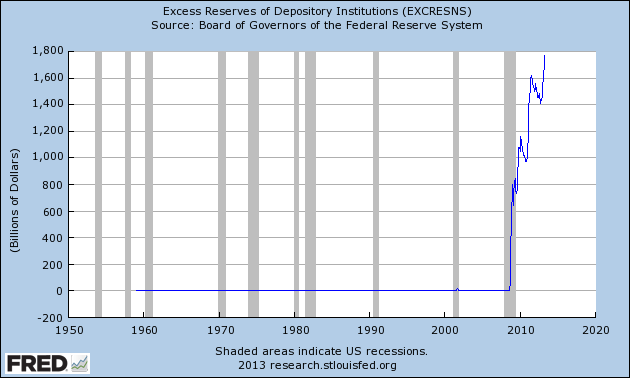 And what that means for conventional method 3 above is that the banks are already in excess of their reserve requirements (see my US graph below), so there’s no point in playing with them. And as for “Open Market Operations”: most Central Banks are not allowed to buy government bonds or treasury bills directly from the government – they have to buy them in the open market from people/institutions that have already bought those bonds/treasury bills. And those folks, in theory, will then use that money to buy more short-term government debt. Which is fine, I guess. Except that most recessionary governments want long-term government debt in order to stimulate for longer periods (without having to be interrupted by pesky repayments of capital). So playing with money demand is out; and playing with short-term money supply is a bit ineffectual. What’s a poor Central Banker to do? 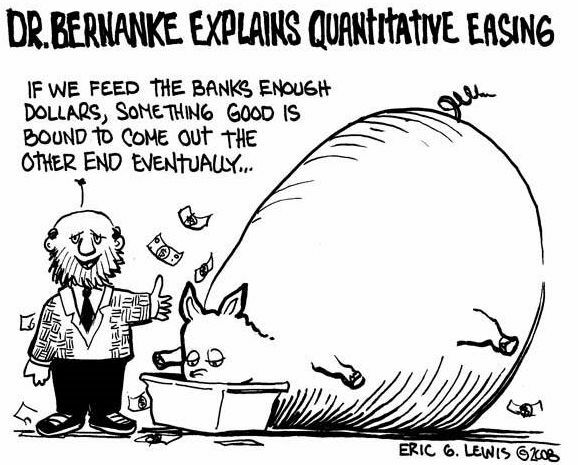 Quantitative Easing: when a Central Bank buys long-term financial assets from banks and other financial institutions in order to drive down long-term interest rates. It’s usually at this point that the eyes glaze over, with terms like “long term” and “financial asset”. And vague questions like “How is that different to open market operations?”. Look at who it’s buying them from. It’s a point that I keep repeating: but the large amounts of the world’s investment money are not in the hands of individuals – they’re in the hands of institutions. Pension funds, medical aid and life insurance funds, etc. Those are the big boys receiving cuts of everyone’s salaries every month. And most of them, being relatively conservative and rational, realise that their obligations to pay out money are going to happen at some point in the distant future. So they will not be holding short-term assets in order to meet their long-term obligations – because that sounds unsound. No – they’ll be holding long-term assets in order to match the timing of their long-term obligations. When the Central Bank starts playing with QE, it is driving up the prices of long-term assets, which consequently lowers the return that these institutions can earn off them in the future. But these institutions have to earn relatively high returns in order to, you know, not go bankrupt when the time comes to pay out. Meaning that those institutions are forced to take up positions in riskier areas like equities. That is: these large institutions will rebalance their investment portfolios in favour of more equity. Why Would They Want That? The Central Bank drives down long-term interest rates by buying up long-term fixed income instruments. Long-term institutional investors are forced to rebalance their portfolios in favour of equity. This increase in demand for equity drives up stock market prices. Listed companies realise that a share issue at this time would raise them a lot of capital really quickly and really cheaply (because, clearly, the market is willing to pay a high price for their quite-dismal recessionary earnings). It also saves them the hassle of having to go speak to those bankers who are being all maudlin about credit ratings and stuff. But what to do with that money once it’s been raised? Well, they can put them into projects that are yielding really low returns – but that’s fine, because no one is asking them to earn a high return. Which will require them to spend that money and hire people to do the jobs. Oh, and there is also an unexpected and not-so-hyped side benefit to all this QE. Pushing that much long-term money into short-term spending makes it rather likely that the currency will devalue. That’ll make exports more attractive to the country’s trade partners, which may also prove stimulative. Quantitative Easing: Where Was The Hyperinflation? Homeownership: why are houses so expensive?